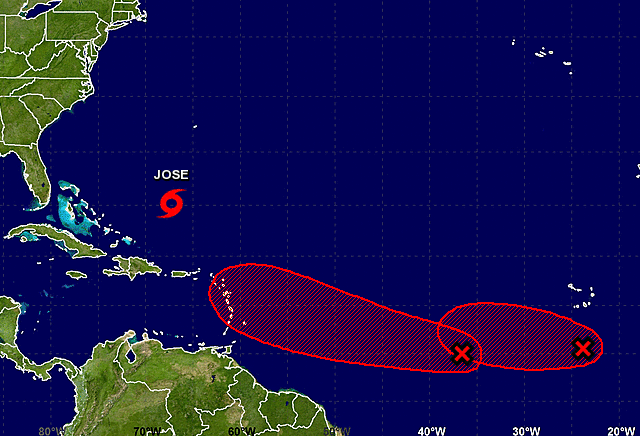 NOAA's National Hurricane Center issued a Tropical Weather Outlook which predicts that more two tropical cyclones may form after Tropical Storm Jose within the next 48 hours. The first system, named Invest 96L, is a tropical wave located about 850 miles west-southwest of the Cabo Verde Islands which continues to produce disorganized showers and thunderstorms. NHC forecasters say that environmental conditions are expected to be conducive for gradual development of Invest 96L, and a tropical depression could form early next week while it moves westward at around 15 mph across the tropical Atlantic. Invest 96L has an 80% chance of tropical cyclone formation within the next 5 days and a 30% chance within the next 48 hours. The second system, dubbed Invest 97L, is also a tropical wave located 300 miles south of the Cabo Verde Islands that is producing a large area of disorganized shower and thunderstorm activity. According to the NHC, Invest 97L continues to become much better organized since yesterday and is likely to form into a tropical depression tonight or Friday as it moves westward at 10 to 15 mph across the far eastern tropical Atlantic. Invest 97L has a 90% chance of tropical cyclone formation within the next 5 days and an 80% chance within the next 48 hours.